LES March E-Newsletter - Photos Inside! Don't Miss Out on Energy Week! -Kate Epsen, NEWIEE Rising Star Awardee! 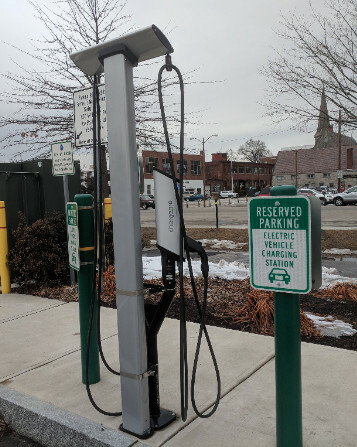 EV Charging Station in Keene. Has your Energy Committee explored deploying EV charging in your town? Don't forget to sign up for these free Energy Week events! Further details here. Town Spotlight: Newport, the "Sunshine Town"
This article sheds light on the types of streetlight tariffs and why some provide greater economic motivation than others for converting to LEDs. The Weatherize program partners local volunteer teams with qualified contractors to complete home performance upgrades. So far, almost 300 people have signed up to participate in the initiative, with more than 100 people already connected with a contractor for professional home energy assessment. Participants who commit to completing energy upgrades will be entered into a $500 drawing toward project costs. The perks of the program run through March 31, so don't delay! If you live in a town participating in Weatherize, visit VitalCommunities.org/Weatherize to sign up and request your home energy consultation today. Lee residents vote and Select Board recommends to move two renewable energy Warrant Articles to the town's March 13th ballot. Article 21 proposes a solar Power Purchase Agreement (PPA) expected to save the town an estimated $140,000-$200,000 over 20 years. Many neighboring towns, including Durham, Brentwood, and Nottingham, have entered into similar solar PPA agreements. Article 22, submitted by petition, requests initiation of a defined process that would encourage Governor Sununu to request exploration of the feasibility of offshore wind power as part of the State's renewable energy options. Portsmouth, Dover, Rye, and Merrimack have passed similar resolutions and 16 other towns have similar articles on the ballot this March. Tuftonboro Select Board approved a proposal for a Community Solar Project, exclusively for Low- and Moderate-Income families. 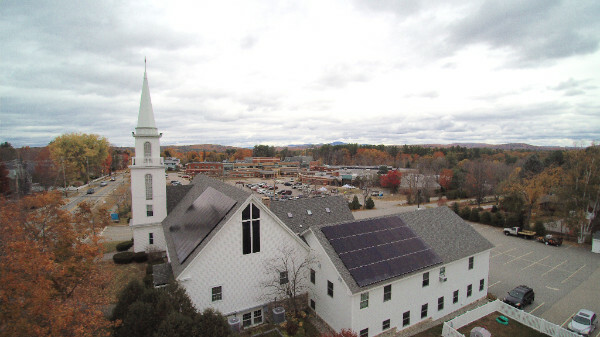 The project plans to apply for Public Utilities Commission grant funding in partnership with NH Solar Shares. Tuftonboro is served by the NH Electric Coop. Learn what you “as a Property owner or Tenant” can do to improve comfort and save money. Join us at Noon on Friday, March 30th and we will bring you up to speed on all of the energy-related bills currently making their way through our New Hampshire Legislature. Continue to learn about EPA’s ENERGY STAR Portfolio Manager tool with a deeper dive into more advanced functionalities such as: editing property data; correcting and updating property use details; using the data quality checker; and sharing property data. A growing number of organizations are taking action to reduce their water consumption to protect against rising costs, mitigate the risk of future water scarcity, and demonstrate environmental leadership. Cutting water waste has the added benefit of reducing the energy needed to treat and distribute water. Learn about tools and resources from the Energy Department and U.S. Environmental Protection Agency that can help you meter and track water consumption, identify savings opportunities, and implement best practices to accelerate your water saving strategies. States are playing an important role in modernizing the nation’s electricity grid. In this webinar, two presentations will discuss the range of activity taking place at the state level. First, Autumn Proudlove, Manager of Policy Research at the North Carolina Clean Energy Technology Center, will present key findings from the most recent edition of her organization’s quarterly report on the 50 States of Grid Modernization. That report describes activities that took place in 2017 in 39 states plus the District of Columbia. See more great Webinars here! The Public Utilities Commission residential solar rebate program is closed and the commercial program is considering changes and will be re-opening. Congratulations Kate Epsen, NEWIEE Rising Star Awardee! Kate Epsen, Executive Director of NHSEA, is New England Women in Energy and the Environment's newest Rising Star Awardee. Read more here. See Kate's Op-Ed in the Concord Monitor on sustainable alternatives to Northern Pass. See UNH Today's recent piece on Henry Herndon's new position with NHSEA and LES here. See Henry's Op-Ed in the Concord Monitor on the importance and impact of local energy action.